Where is Malta located? What are these tiny European islands all about? Here are the best things to do in Malta, the best Malta beaches to visit, and everything else you need to know to plan a trip. First things first: Where is Malta? Malta is located in the middle of the enchanting Mediterranean sea. The Italian island of Sicily is 50 nautical miles to the north. The North African country of Tunisia is approximately 200 nautical miles to the west. If you head east across the Mediterranean from Malta, you’ll sail below the boot of Italy and eventually stumble on the Greek islands. North African and Italian influences can both be felt on the islands, along with leftover British vibes from their rule that lasted until 1964. But Malta doesn’t feel strongly like any other nation. Malta is uniquely Malta. That’s why you need to experience this small country’s massive personality for yourself. Malta is actually three neighboring islands: Malta (the biggest), Gozo, and Comino. All three islands are less than 30 minutes apart by ferry. Malta is the biggest island and home to the country’s capital, Valetta﻿. 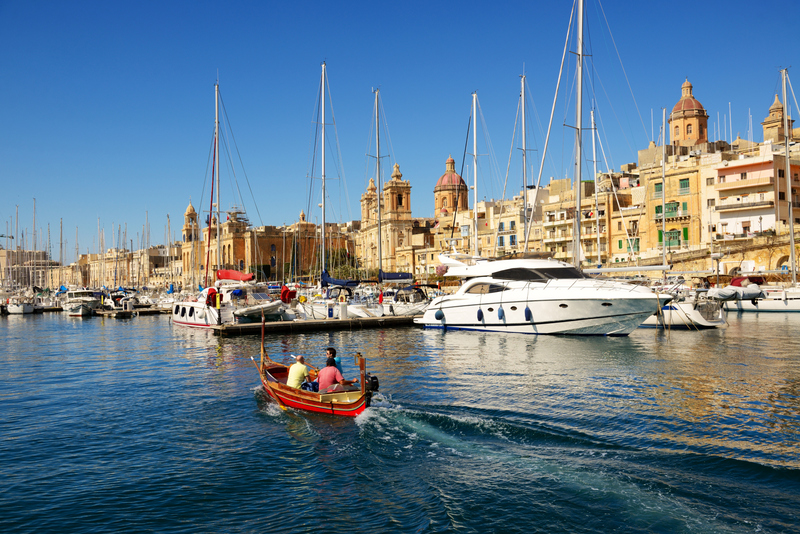 Malta’s sunny climate provides plenty of time to explore Valetta’s Grand Harbour, its stunning Baroque architecture, and its modern wine bars and cafes. The nightlife hotspot of St. Julian’s is a popular place to stay on Malta. Harborside steps descend down to the water and are a popular spot for daytime reading or late night drinking. Colorful Maltese fishing boats bob in the water and nearby you’ll find everything from casinos and reggae bars to fine dining restaurants. Where is Malta? Malta is located in the stunning Mediterranean Sea. The seaside promenade that runs through St. Julians will lead you to neighboring Sliema in about 20 minutes. Quieter, (but not too quiet,) Sliema has an irresistible coastline of smooth, sandstone rock beaches and casual seafood cafes. 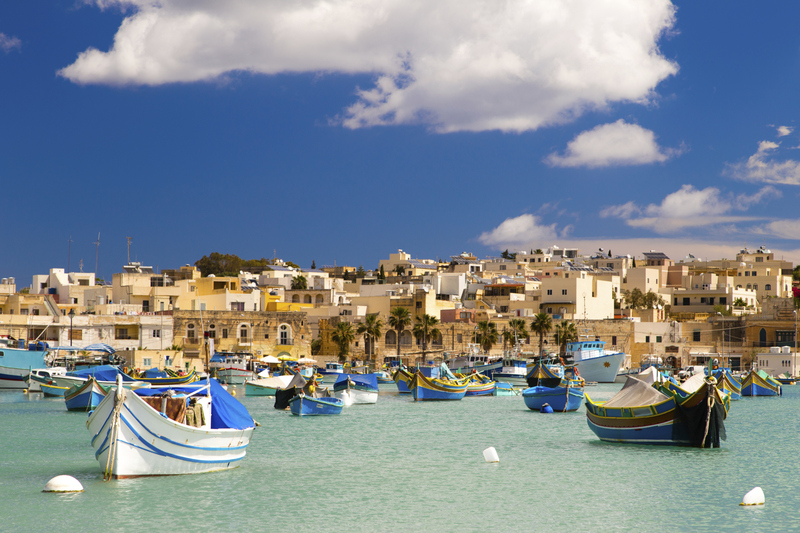 For the freshest ocean-to-plate dining, head to Marsaxlokk, a small fishing village on Malta. Here, the local fisherman haul in the morning catch and the waterfront restaurants prepare it (deliciously) for you by lunchtime. The ancient hilltop city of Mdina, the sandy beaches of Mellieha, the Dingli Cliffs, and Popeye Village are other interesting things to do in Malta. The bus system on the island is reliable and comprehensive, but renting a scooter or car is highly recommended for a day or two to explore the islands at your own pace. Comino, the smallest island of Malta, is most known for its famous Blue Lagoon. There are no paved roads on Comino. Instead, the landscape is rich in herbs and flowers, namely the abundant Cumin plant from which Comino gets her name. In the waters, scuba divers can find secluded coves hidden in the clear, azure waters. Want to get blown away by history? 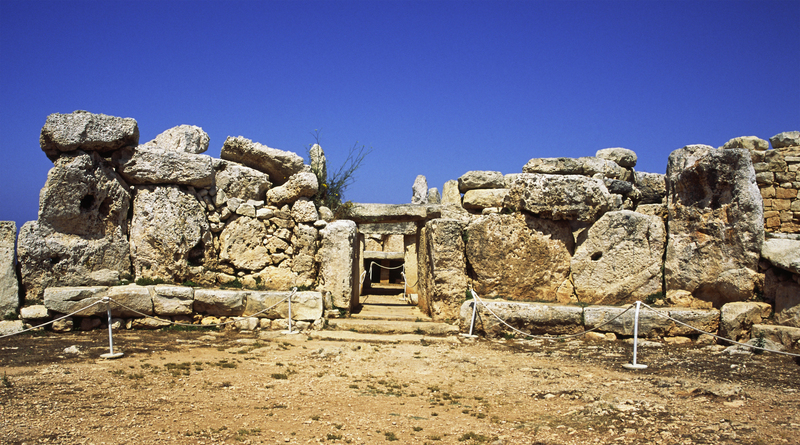 Gozo has ancient ruins that are older than Stonehenge and the Pyramids of Egypt. Seriously. This teeny island in the middle of the Mediterranean is home to Ġgantija, the ruins of a temple with some of the oldest, freestanding stone buildings in the world. It’s worth heading inland to see the ruins and the spectacular views over the whole island. Malta beaches have… personality. To say the least. As you curve around the island, the coastline changes drastically. Towering white cliffs span one stretch, while golden-sand beaches, rocky lagoons, and small seaside villages dot the rest. Watch your step as you walk along the smooth, rock beaches below the seaside promenade in Sliema. The water-washed sandstone slabs can be slippery and full of holes that create mini-pools in the rocks. Metal ladders are built into the side of the large stones so beach-goers can lower themselves into the wavy Meditteranean. In places, natural ocean pools are built among the rocks where you can peacefully submerge. It’s the wildness and character of the rocky Malta beaches that makes them irresistible. 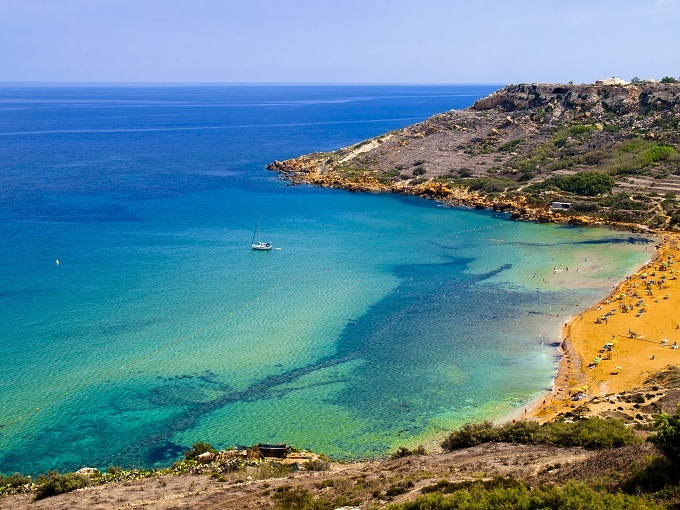 On Gozo, Ramla Bay is a golden sand paradise. Lush green vegetation surrounds the rocky cove’s crystal clear waters on this small, moon-shaped, sandy beach. Close to St. Paul’s Bay city center and its charming square, this beach is perfect for combining a day of sunbathing, swimming, and leisurely wandering through town. The water here is refreshing and flawlessly clear, but that’s pretty standard for Malta beaches. 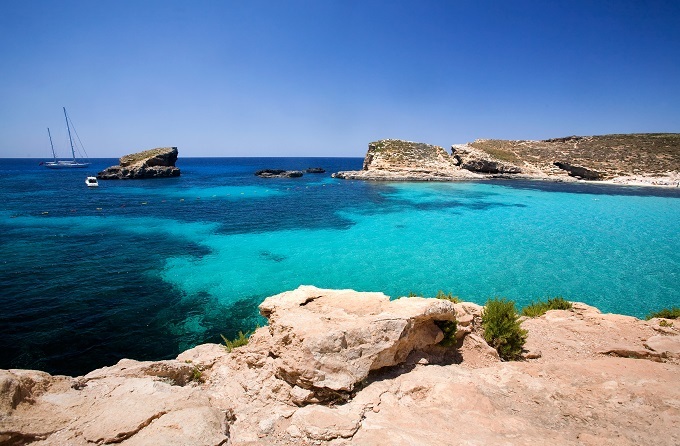 In conclusion: find the Mediterranean and dive in… you can’t go wrong with Malta beaches. Or consider adding a visit to Malta as part of your next trip to Europe. Cheap flights can be found to Valetta from many major cities in Europe.